Finish strong with the spelling words for week 36 of the 5th grade spelling program! This week, you will practice sight words, Greek roots graph/fract, and academic vocabulary. The spelling list for week 36 is made up of: Illinois, yeast, notify, biography, geography, autograph, autobiography, choreography, graphite, fracture, infraction, refraction, improvement, equine, pelican, engage, animation, motion, studio, and cartoon. 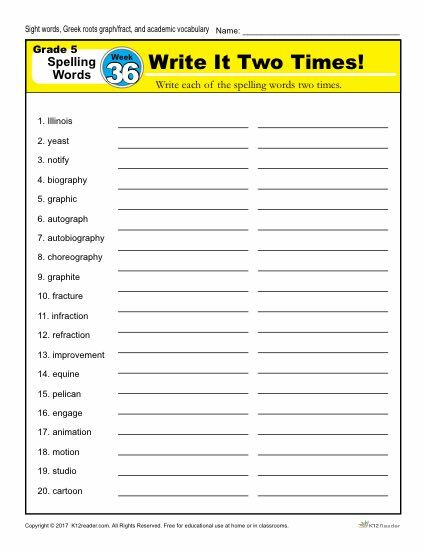 After learning these words, students will practice their reading and writing skills by completing the printable spelling worksheets that we have included below. To get started with the last week of the 5th grade spelling program, click here.